Even though they may remain volatile in the run-up to the polls as political parties stitch up alliances, the long - term trajectory for the markets remains up, they believe. 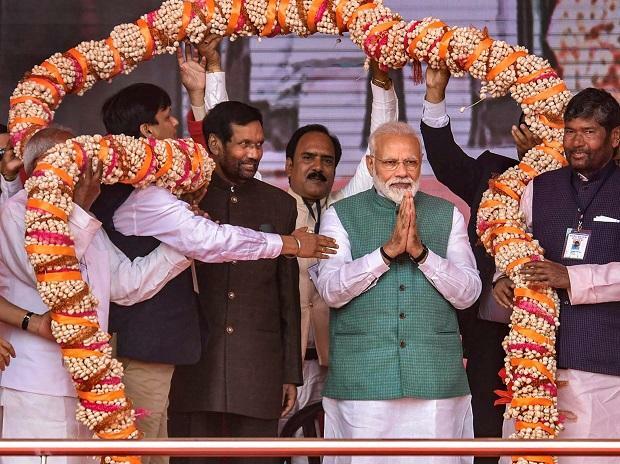 Markets are already pricing in a victory for the Narendra Modi – led National Democratic Alliance (NDA) in the upcoming general elections, analysts say. 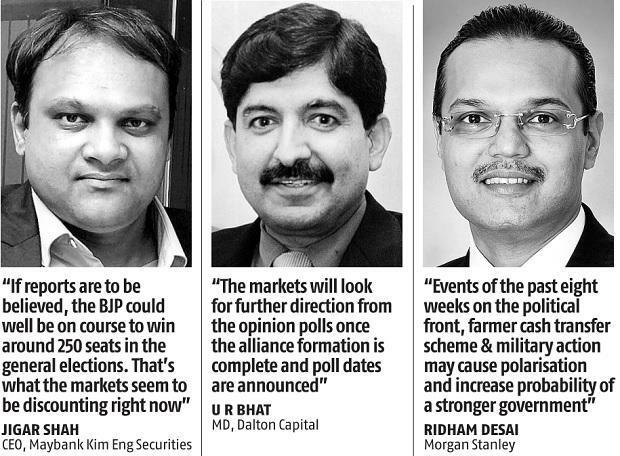 Even though they may remain volatile in the run-up to the polls as political parties stitch up alliances, the long – term trajectory for the markets remains up, they believe. “The events of the past eight weeks on the political front including various pre-poll formations, the farmer cash transfer scheme and the military action across the border may cause polarisation in the forthcoming general elections and increases the probability of a stronger government,” says Ridham Desai, head of India research and India equity strategist at Morgan Stanley in a co-authored report with Sheela Rathi. Oil prices and political uncertainty – the two main reasons why the Indian bourses underperformed in the calendar year 2019 (CY19) – have already hit a peak in terms of negativity, they believe. “Growth is moving higher with PMIs in clear expansion zone, credit growth at multi-year highs, corporate revenue growth at almost a 20-quarter high and corporate profits at 25-quarter highs. In summary, the Nifty could be looking to break its 10,500 – 11,000 range to the upside,” Morgan Stanley says. Thus far in CY19, the S&P BSE Sensex and the Nifty50 have gained 1.5 per cent and 1.7 per cent, respectively. S&P BSE IT, Consumer durable, Oil & Gas, Realty and Bankex have outperformed with a gain of 1.9 per cent – 7.8 per cent during this period. 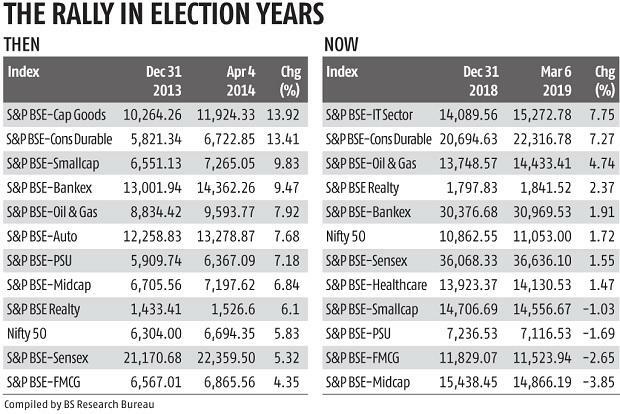 Back in 2014 when the general elections commenced from April 07, the S&P BSE Sensex and the Nifty50 had soared 5.3 per cent and 5.8 per cent, respectively between January 01 and April 06, data show. Gains in the mid-and small-cap indices, however, were higher at 6.8 per cent and 9.8 per cent, respectively during that period. “For the markets, the fact that Narendra Modi will return to power is a given. There is no doubt about it. That’s one of the reasons why we have seen the recent readjustment, especially in the mid- and small-caps. If reports are to be believed, all is going well for the ruling dispensation and things have started to look up after the recent military action. The markets will look for further direction from the opinion polls once the alliance formation is complete and poll dates are announced. The Nifty50 can hit 11,500 levels going ahead,” says U R Bhat, managing director at Dalton Capital. As a portfolio strategy, Morgan Stanley prefers GARP (growth at reasonable price) stocks among banks, discretionary consumption and industrials – both in the large-cap and the mid-cap universe. “If reports are to be believed, the Bharatiya Janata Party (BJP) could well be on course to win around 250 seats in the upcoming general elections. And that’s what the markets seem to be discounting right now. As regards the mid-caps, they had been arbitrarily punished. As the overall market sentiment is turning positive possibly due to higher probability of Modi getting voted back, the tide has also turned for the mid-and the small-caps,” says Jigar Shah, chief executive officer at Maybank Kim Eng Securities. M & M Financial, Page Industries, Sun TV, LIC Housing Finance, Alkem Lab, Emami, Federal Bank, Indian Hotels, JSPL, CG Consumer Electrical, CESC, Persistent Systems, Birla Corporation, Ashoka Buildcon and Brigade Enterprises are the top picks of Gautam Duggad, head of research, at Motilal Oswal Securities in the mid-cap universe.